If any composer had utilised the ghazal andaz of Mohammad Rafi to the best of his potentiality it is Madanmohan whose name appears in the minds of the lovers of music across the nation. Madanmohanâ€™s father Rai Bahadur chunnilal send his son to Dehradun to join the army. Instead he left the army and joined All India Radio in Lucknow. He came in contact with Ustad Faizz Khan, Ustad Ali Akbar Khan and carried on their legacy in the compositions he made for 30 years which can be classified as masterpieces. As Madanmohan was not associated with the Big Banners like RK or Navketan, he was not categorised with any star of bollywood during 50s, 60s, 70s. Further he never wanted to balance the popular test of music and excellent class of classical compositions he created. But the compositions were so rich in lyrics and tunes that the musical pandits had no way but to admire them. The golden age of bollywood music was categorised with the excellence of Mohammad Rafi and as such if any composer neglected Rafi and tried to reach the summit of popularity they have invited their own downfall. Madanmohan did not make such a mistake. He started his career with the film Ankhen in 1950. He also composed music for Raj Kapoorâ€™s film Ashiana in 1952. His notable songs for Rafi in the film Railway Platform, 1956, include â€œbasti basti parbat parbatâ€. In Gateway of India, 1957, Madanmohan used Mohammad Rafi for the song â€œdo ghari woh jo pass aa baitheâ€ picturised on Bharatbhushan. It was very successful and strengthened the everlasting bond of Rafi with Madanmohan. Rafiâ€™s intoxicating appeal in the song â€œkabhi na khabhi kahin na kahin koi na koi toi ayegaâ€ in the film Sharabi, 1964, composed by Madanmohan can be classified one of the best songs in sombre mood. The most majestic ghazals of Rafi composed by Madanmohan include â€œkisiki yaad me apnako hai bhulaye huyeâ€ and â€œbaad muddat ke yeh ghari ayiâ€ from the film Jahan ara, 1964, picturised on Bharat Bhushan. Talat Mehmoodâ€™s song in the same film â€œphir wohi sham wohi gham wohi tanhai haiâ€ was also based on ghazal andaz. The classic lyrics were written by Rajinder Kishan. The film titled Ghazal, in 1964, was based on ghazals and Rafi was outstanding by every standard in the song â€œrang aur noor ki baraat kise pesh karun.â€ In the same year Rafiâ€™s patriotic flavour was bolstered in the song â€œkar chale hum fida jan-o-tan sathiyonâ€ in the film Haqeeqat, where Rafiâ€™s ghazal titled â€œhoke majboor usne bulaya hogaâ€ shared with Bhupinder Singh, Manna Dey and Talat Mehmood was sensational.1 The majestic lyrics were written by Kaifi Azmi. In the film Neela Akash, 1965, picturised on Dharmender, Rafiâ€™s song â€œakhri geet muhobbat ka sunayun to chalunâ€ showed the tragic note of Madanmohan. In the film Need Hamari Khwab Tumkhari, all the songs were sung by Rafi including â€œhusn ne jab isq se takraya thaâ€. Returning back to ghazals, Rafiâ€™s song â€œaap ke pehlu me akarâ€ in the film Mera Saya, 1966, was as outstanding as Lataâ€™s title song â€œtu jahan jahan chalega mera saya saath hogaâ€. The lyrics were written by Raja Mehendi Ali Kahan. Raj Khoslaâ€™s crime thriller ended up becoming a musical blockbuster just like Woh Kaun Thi, in 1964, where Madanmohanâ€™s composition â€œnaina barse,â€ â€œlagja galeâ€, etc. for Lata Mangeshkar was probably the most immortal creation in the history of film music, with Sadhna giving life time performances in ghostly characters in both these films. Bhupinder Singh was a great admirer of Rafi. In his interview in DD India, he said, he got a chance of acting and singing in the film Haqeekat and he was supposed to share the microphone with another singer for the song â€œhoke majboor usne bulaya hoga.â€ He chose Mohammad Rafi to share the microphone with and as he was taller than Rafi, Rafi was given a tool to balance the voices. Manna Dey and Talat Mehmood shared the other microphone. This entry was posted on Sunday, October 12th, 2008 at 2:05 pm	and is filed under Meri Awaaz Suno. You can follow any responses to this entry through the RSS 2.0 feed. You can leave a response, or trackback from your own site. Get in touch Souvik, need a few old references of song snippets which you will surely know of! hope all is gung ho with you…. rafi saab,s combination with madan mohan has created history . after NAUSHAD and o.p.nayyar itwas madan mohanji who got the best songs from RAFI.MADANMOHANJI WAS GREAT ADMIRER OF rafi .he had composed best ghazals off RAFI which will be remembered for ages to come.on one occassion he said if RAFI refuses to sing he will no more compose music .this shows the closeness and dedication, friendship and sincerity of a great music director of all times .he is next to NAUSHAD a musician of high standing …………. Excellent article having so much of informations on the best combo indian Film music industry ever had . rafi/mm/lata is my favourite combination. What a song list the combination have? there are no words to praise. listening songs of the combination gives immense pleasure & insight into rela indian classical music. composition to produce magical effect. Madan Mohan, Salil Choudhury, Naushad, S D Burman and in Bengal Sudhin Dasgupta – what great musicians. True artists – all of them. I mean can you imagine these people “marketting their music”! Did their melodies ever need marketing. Did they think of utilising music for money, power and fame! Madan Mohan fans should listen to the Rafi Asha duet – “Jis din se maine tumko dekha hai”, a song not in the typical MM ghazal mode. What orchestration and range! Madanmohan had given Rafi melodious songs in the film Aap Ki Parchaiyan. Even the song “akhri geet muhobbat ka sunayun” in Neela Akash captured the sombre mood of Rafi. All the songs composed for Rafi in the film Chirag were successful. Madanmohan had very sweet relationship with the master singer and it never mattered with KK had got additional popularity in the 70s to Madanmohan because he knew the ghazal andaz of his songs could only be captured by Rafi and Lata. Madan Mohan.My ultimate favourite.I love all the MM Songs of Rafi Saab and Lata ji.When I hear ‘Chirag dil ka jalao bahut andhera hain'(Chirag) I cry.When I hear ‘Duniya se sare gamom se begana ,mein hoom mastana'(Mastana) my heart fill with Joy.Rafi/Lata/MM What a combo! BY RAFI SAHAB & CHORUS ). THANKS FOR YOUR VERY FINE ARTICLE ! I HAVE REALLY ENJOYED READING IT . 3) ” TERI AANKHON KE SIVA .”( FILM : CHIRAG ) . Madan Mohan is one of my personal favourites. His compositions are all very high calibre. Only high calibre singers could sing his compositions, where Rafi and Lata where the maximum contributors. Perhaps one of the reasons that he compositions where less compared to his contemporarires, but all quality ones. My list of 25 ultimate gems of Madan Mohan. The song “Lo ek kali muskayee” from “Ek kali muskayee” is another gem that needs to be mentioned. Also, the sweetness in Rafi’s duet “Mujhe yeh phool na de” with Suman Kalyanpur in 1963’s Gazal is beyond description. Lovely and very informative article Souvikji. mm had the knack of composing the finest of ghazals and with rafi sahab and lataji around, he crafted some of the very best as listed out in your article. the song ‘ main nigahen tere chehere se hataun kaise’ is a classic example of ghazal composition and rafi sahab’s rendition added many more feathers to it. all other compositions listed in the article and in other valuable comments too are exemplary. it is surprising that rafi sahab-dilip kumar-madan mohan combination did not exist. and yes “main yeh sochkar uske dar se utha tha” though a short song is an exceptional compostion and very emotional playback singing by rafi sahab. In response to rajprakashji’s query, one can’t think of any film with dilip-rafi-madan mohan. However, there is one film with dev anand-rafi-madan mohan, namely, sharabi (1964) with three exquisite melodies (sawan ke mahine mein, mujhe le chalo aaj phir us gali mein and kabhi na kabhi, kahin na kahin…. The moving lyrics have been penned by rajinder kishen. I will add one more ghazal of Rafi Sahib under Madanmohan composition, which is Mein Nighahein tere chehre se hataon kaise. This ghazal is marvelous and uncomparable. Can anybody tell me if Dilip Kumar +Rafi+Madan Mohan came together in any film? On second thoughts, I feel ‘Kehna ek deewana…’ is a Jaidev score. MM died midway during the production of Laila Majnu and Jaidev took over. I’m not sure which all songs (actually all the songs in the movie are top-class) MM composed and which all, Jaidev. May be some of the knowledgable people here can throw light on it. Speaking about ‘kehana, ek deewana..’, I believe You’ve not only heard the song but watched the picturisation as well. It’s amazing how Rafisahab (of the smoothest voice imaginable) sounds exactly like the tired, hungry, desperate guy abandoned in the desert. His voice is (deliberately) husky, somewhat dry, yet as melodious as ever. And when he goes up skywards with the final ‘Laila…..’ , comes back and then goes down (with a deliberately cracked voice), it’s absolute perfection… I just can’t imagine a better rendition..
kehna, ek deewana is one helluva song..great rendition…soaring heights and plumetting lows with effoertless transition…all made to sound so easy and effortless…hadnt heard it before..many thanks..
Nice write-up, Souvikji, Keep up the good work. Madanmohan-Rafisahab was one cracker of a team the likes of which (as rightly mentioned) we will never see again. What haunting melodies this team produced, one after another, any one of which would be sufficient to give legendry status to the MD and/or the singer. Thanks for email and receiving information about Rafi Sahab the lovely singer of India as well as of world. The only regular camp of Madan Mohan was that of Chetan Anand. Films like Haqeeqat, Heer Ranzha, Hindusthan Ki Kasam, Hanste Zakhm, Aakhri Khat had wonderful music by MM. In a recent Mannadey show at Bangalore, Mannada while praising MM very humbly told that MM came out with wonderful Gazals sung by Rafi and Lata, and howsover he tried, he could not sing as well as those two singers did. Excellent article by Souvik, Mohdrafi sang many songs under Madanmohans composition. There is one great song “Tumse kahoon ek baar” from Dastak, what a song it is and how rafisaab sang it. I love that song so much that atleast 5 times i listen to it. There is another song which Madanmohan composed from the film “Haqeekat”, the song is “Hoke Majboor mujhe” sang by Talat Mohd, Mohdrafi, Bhupendra and Mannadey. Its a great great song. Very informative article. Madanmohan was a very versatile Music Director and his combination with Mohd. Rafi was very successful. I really love the song ” Hoke Majboor mujhe husn bulaya hoga” of the film “Haqeeqat” with the Rafi Saab sharing the microphone with other co-singers. Madanmohan’s genius was also reflected in his two superb creation in the songs ” Hum ko aya na gaya tumko bhulaya na gaya” sung by Talat Mahmood and “Kaun aya mere man ke dware, payel ki jankar liye” sung by Manna Dey in the film “Dekh kabira Roya”. An excellant article Janab Souvik Chatterji Sahab, Congartulations! 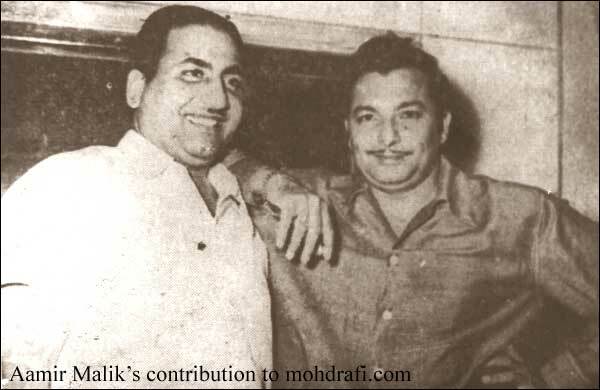 Rafi Sahab and Madan Mohan was a superb team. Aankhen was the first movie of Rafi Sahab and MM sahab, lyrics by Raja Mahdi Ali Khan – Ham ishq me barbad hain, barbad rahenge, dil royega, the year 1950. According to Mr. Saleem-ul-Haq’s biography of Mohd. Rafi’s book, Rafi Sahab sang 88 solos,63 duets and 9 chorus for Madan Mohanji. good article madan mohan is definitely one of the best mds of all time although the media have decided to sideline him too just like other greats. his gazal compositions r the best without 2nd thoughts. u have mentioned quite a few songs of his but u forgot to mention the very moving n touching gazal ‘main yeh sochkar uske dar se’ from haqeeqat wch definitely ranks as one of his best compositions. ‘yeh duniya yeh mehfil’ wud always feature in my 5 top rafi songs wht singing n lyrics n expressions r just out of this world. grt grt song..!! btw i hope u enjoying ur stay in my state !! in 1970’s when other MD and film maker they tried to not use Mohd Rafi but Modan Mohan was one of few who was with Mohd Rafi.when film actor and film maker tried to force him to use other singer else than Mohd Rafi he said if mohd rafi will not sing he will not give music in the film.also he gave great song to othere singers but with Mohd Rafi and Lata ji he had the best as I think…I think Madan Mohan is one the best all time MD.